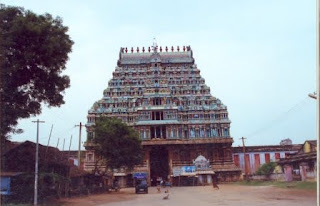 The main temple here in Tiruvarur is the Thyagesar Temple. It is also called the Thyagaraja Swamy Temple. The Lord Siva here is called Thyagesar and the Ambal here is called Nilothpalambal aka Alliyankodhai. A very endearing sculptural marvel here is in the sanctum sanctorum itself. A woman stands beside Ambal and she’s essentially the friend of Ambal and she carries Lord Muruga aka Lord Subramaniya on her hip. Lord Ambal’s left hand is on Muruga’s head. The whole scene is so endearing and loving. 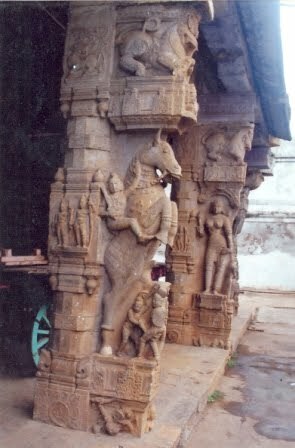 And this scene is depicted both as the Moolavar (Stone Sculpture) and Uthsavar (Bronze Sculpture). 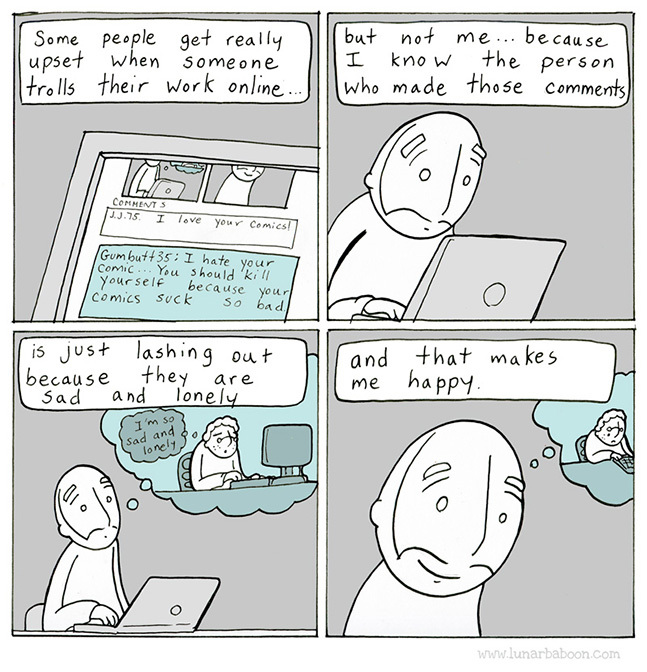 Such a depiction is seen no where else. A shrine for the fierce form of Lord Shiva’s consort called Durga is also there in this temple. She is called the Rowdhra Durga aka Erisina Kottravai. There are 8 shrines of different Durga all over this temple. The first shrine is of Mahishasura Mardhini and 3 more Durga in the first shrine and 4 more in the 2nd shrine. Other shrines here are of Navagraha, Runa Vimochanar, Vishwakarmeshwaram which is essentially the Sivalingam worshipped by heavenly sculptor Viswakarma, Sahashralingam which is essentially the Sivanlingam which has a thousand miniature lingams all over it, Vathapi Ganapathi, Veedhi Vidanga Vinayakar, Vallbhai Ganapathi, Aingalakkasu Vinayakar aka Azhagiya Chola Vinayakar, Maatruraitha Vinayakar, Uchishta Ganapathi, and a Standing Ganapathi. Another specialty here is the Chandikesar shrine. All the temples have only 1 chandikesar. Here, this temple has 2 shrines of Chandikesar. One is usual and the 2nd one is considered to be Yaman (Messenger of Death) himself. He has a beard and matted locks. There is a very interesting story behind this. Being born in Tiruvarur itself is considered as a direct ticket to go to heaven on death – as they say Being born in Tiruvarur, Being lived in Mylapore, Being dead in Benaras are direct tickets to go to heaven. So Yama got so offended that he has just no work here in Tiruvarur. 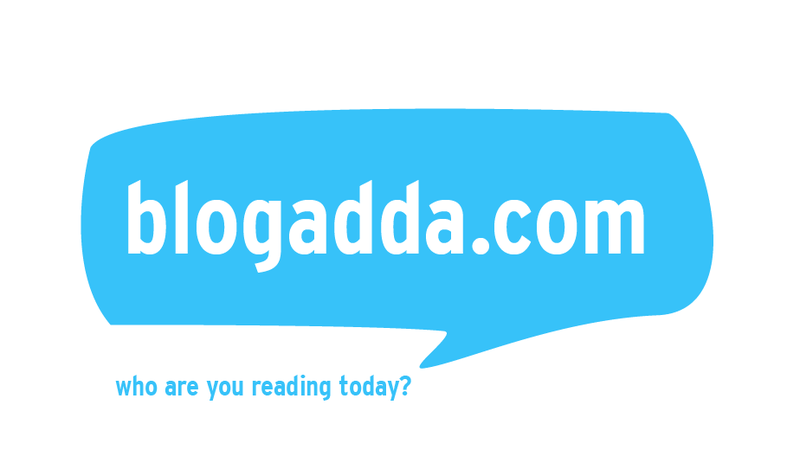 So lord Shiva said to him that he may be here as the second Chandikesar. So he is called the Yamachandesar. The sculptures & relieves on the pillars are beyond words. They are so intricate and fabulous!!! Also within this temple is another little temple called the Kamalambal Temple. This is considered one of the 64 Sakthi Peedam. 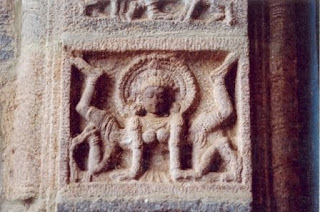 The Goddess here is Kamalambal who is the mixture of the 3 Goddesses of Hinduism (Ka-Kalaimagal (Saraswathi); Ma-Malaimagal (Parvathi); La-Alaimagal(Lakshmi). There is a point in this temple from where all the 7 Gopurams of this temple are seen. Oh yeah, essentially this temple has 7 Gopurams; 4 on the four directions of the outer boundary of the temple; 3 located in different locations within the temple. 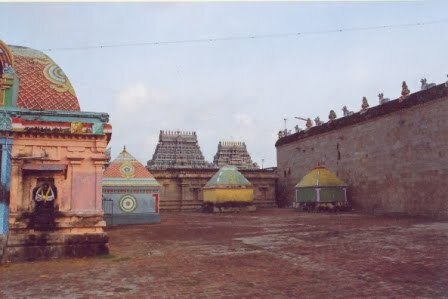 The temple has a couple of halls like Devasiriya mandapam, Rajanarayana mandapam, Rajendra Chola mandapam. 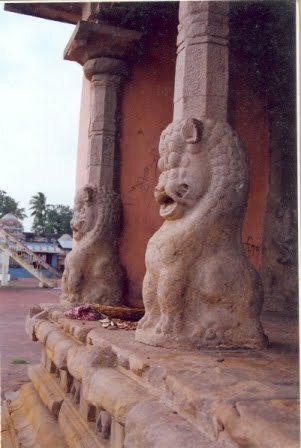 The Rajanarayana mandapam has the Simhathoon, the pillars with lion which reminded me of the similar ones in Mahabs. The Devasiriya Mandapam was the reason why I mainly ventured to the temple – the still surviving ancient pantings here. However much to my disappointment, I couldn’t make it to the mandapam. After Mylapore Kapaleeswarar Temple, I think this is the only temple where I almost spent days together appreciating and losing myself in the serenity and aesthetics of the temple architecture and paintings especially. Here comes my favourite part of the temple – the ancient paintings in the temple. 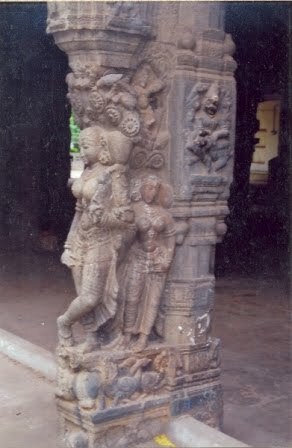 This temple has ancient paintings from the Chola Reign. 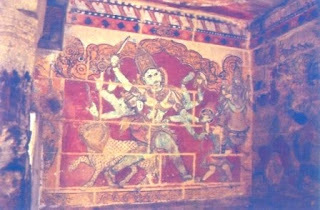 But later during the Maratha era, they had painted over the Chola Paintings in 17thC. Actually there are very less number of places where Chola paintings still exist. Chola paintings have been recently found in the Tanjore Big Temple. Here in Tiruvarur, at places the Marata paintings have got peeled off and the Chola paintings are visible below them. 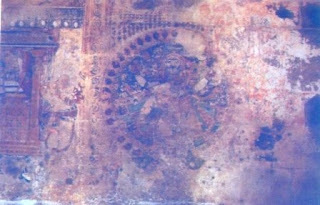 Here are some of those Chola Paintings revealed under the peeled off Marata layer. This temple is supposed to have existed ever since sixth century AD. However the present rock structure came into existence in the Chola era during the 9-10C AD during the reign of King Aditya Chola and was continued under the reign of Queen Chembiyanmadevi. The epitaphs in the temple are the proof for it. 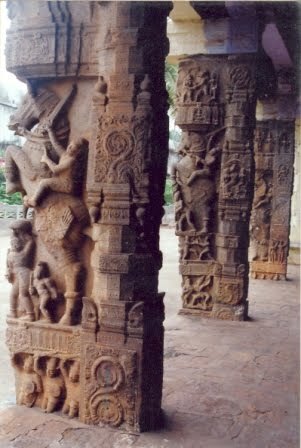 Later certain extensions were done by the Vijayanagara Reign by King Krishnadeva Rayar. 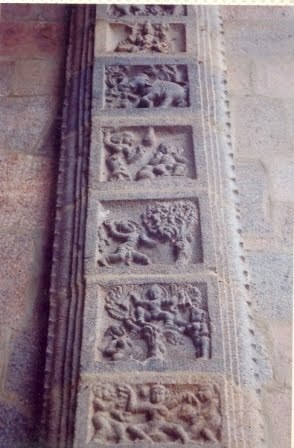 At the entrance just below the Rajagopuram is this series of relieves of the Krishna leela which is essentially the pranks played by Lord Krishna in his childhood. So dance poses called Karanas were on the other side. Just opposite to the temple is the Kamalalaya Kulam which is the pond of the temple. In this pond centrally placed is the Naganadha Temple. I’ll get back about this temple soon. To Stay: Thiruvarur has several low & middle end local hotels & lodges. Dedicated to my Mom & Pop. So many interesting places to visit! You really enjoy all the marvels around you, don' you? Thinking about all those ancient buildings and the life that once was lived in them always blows me away. Have a Happy and Successful New Year!! Wish you all the best!! 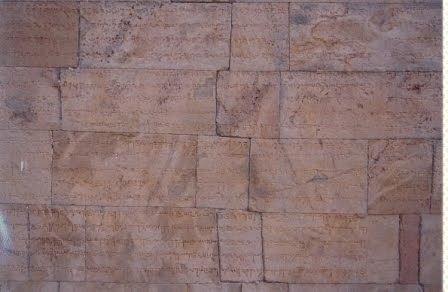 Horus and Sobek wait for you at Kom Ombo... Enjoy! Happy New Year my friend. May 2011 be filled with friendships and laughter. Wonderful carvings and paintings.You have given a lovely narration about this temple complex with very interesting photos.It is a great in depth study in religion and history. Its amazing to live here actually... So many ancient marvels are just a part and parcel of our lives!!! Thank you so much for the appreciation cheta!!! Gorgeous landscape, amazing monuments, excellent pictures. Great to meet someone who was born there!!! Thanks for dropping by & commenting dear!! !